Background: Alzheimer's Disease (AD) is the leading cause of dementia among the aging population. This devastating disorder is generally associated with the gradual memory loss, specified by a decrease of acetylcholine level in the cortex hippocampus of the brain due to hyperactivation of cholinesterases (acetylcholinesterase (AChE) and butyrylcholinesterase (BChE)). Objective: Therefore, inactivation of AChE and BChE by inhibitors can increase the acetylcholine level and hence may be an encouraging strategy for the treatment of AD and related neurological problems. Method: In this contribution, two series of chromenone-based derivatives were tested by Ellmann’s calorimetric method for AChE and BChE inhibition. Results: All the compounds showed inhibitory activity against cholinesterases and some of them exhibited dual inhibition of AChE as well as BChE. The most potent inhibitor of AChE was 2l having an IC50 value of 0.08 ± 0.03 µM, while 3q inhibited the BChE with an IC50 value of 0.04 ± 0.01 µM. In case of dual inhibition, 3h showed an inhibitory concentration of 0.15 ± 0.01 µM for AChE, and 0.09 ± 0.01 µM for BChE. 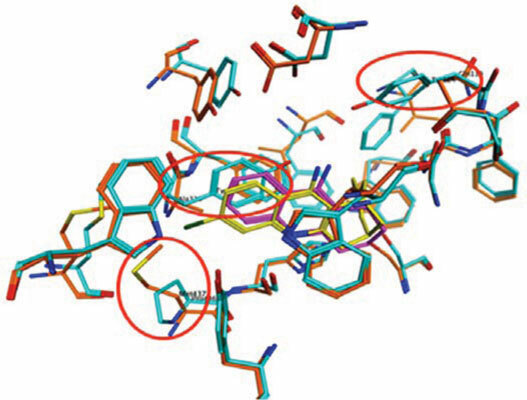 Molecular docking studies were performed to explore the probable binding modes of the most potent dual inhibitors. Conclusion: It can be hypothesized that the inhibitors are able to target cholinesterase pathways and may emerge as a suitable outset for the further development process. Keywords: Alzheimer's disease, amino acid, chromosome, chromenone derivatives, cholinesterase inhibitor, molecular docking. Keywords:Alzheimer's disease, amino acid, chromosome, chromenone derivatives, cholinesterase inhibitor, molecular docking. Abstract:Background: Alzheimer's Disease (AD) is the leading cause of dementia among the aging population. This devastating disorder is generally associated with the gradual memory loss, specified by a decrease of acetylcholine level in the cortex hippocampus of the brain due to hyperactivation of cholinesterases (acetylcholinesterase (AChE) and butyrylcholinesterase (BChE)). Alzheimer Disease and Diabetes Mellitus: Do They have Anything in Common? Fatty Aspirin: A New Perspective in the Prevention of Dementia of Alzheimers Type?